Point Mugu is an unincorporated part of Ventura County that is derived from the Chumash word Muwu, or beach. Other than the Naval Base, probably the most well known fixture in Point Mugu is the Mugu Rock. Mugu Rock is a large rock formation that was formed when Pacific Coast Highway was built and cut through the mountain that now resides on the other side of PCH. Before PCH was built, a road went around the rock, where a chain link fence has been placed to keep people away from this hazardous area adjacent to the Pacific Ocean. PCH was cut through Point Mugu from October 1937 to February 1940, according to this interesting KCET article. Mugu Rock is located just a few miles near the northwest tip of PCH before it veers north towards Oxnard. It is about a 10 mile drive from the Camarillo Premium Outlets and about 20 miles from the heart of Thousand Oaks taking either the 101/Lewis Road route or the slightly slower, curvy and interesting Potrero Road route. 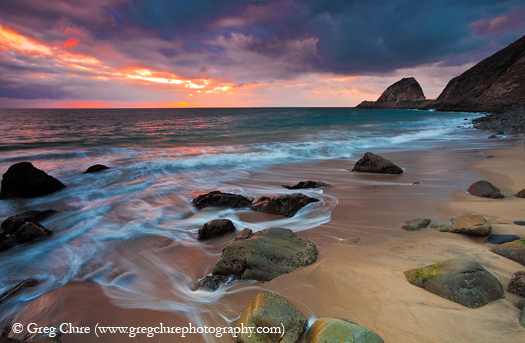 Professional landscape and wildlife photographer Greg Clure of Newbury Park has shared a couple neat images facing Mugu Rock from the south. Visit Greg's website at www.gregclurephotography.com for more of his outstanding work. And here is some not so professional video footage of Mugu Rock from the north.